Find the best quality replacement undercarriage parts at low prices. You’ll get access to parts for Bobcat, Kubota, Takeuchi, Mustang, Gehl, and Morooka machines. We carry a wide range of parts–including sprockets, rollers, and idlers. Our replacement parts are manufactured with the same quality control procedures as our well-known rubber tracks. The best part is they are all in stock and ready to ship as soon as you order. You may even get them the very next day! Get durable drive sprockets for your excavators, loaders and tracked carriers. Made in the USA with high-quality materials and boasting a comprehensive warranty, our sprockets are designed for the durability of OEM parts at the price of aftermarket products. We keep a very large inventory of high performing rollers for the most brands of excavators, loaders and tracked carriers. Our rollers are made in the USA of high-quality materials and come backed by warranties. Take advantage of our wide range of idler assemblies and components. We offer front and rear assemblies and multiple applications for most machines. Our idlers are built with high-quality materials and come with a comprehensive warranty. 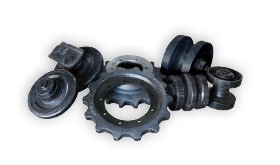 We carry rubber tracks, sprockets, rollers, and idlers. Call 866-366-0225 for more details. DIY Track Loader Maintenance – The key to keeping your compact rubber track loader operating is regular undercarriage maintenance. GUIDE: Installing rubber tracks – Took your track off to install new parts and need to put the track back on? See our guide on How To Install Rubber Tracks with full descriptions and images for each step.